(Nanowerk News) Graphene has caused a lot of excitement among scientists since the extremely strong and thin carbon material was discovered in 2004. Just one atom thick, the honeycomb-shaped material has several remarkable properties combining mechanical toughness with superior electrical and thermal conductivity. Now a group of scientists at Iowa State University, led by physicist Jigang Wang, has shown that graphene has two other properties that could have applications in high-speed telecommunications devices and laser technology – population inversion of electrons and broadband optical gain. Wang is an assistant professor in the Department of Physics and Astronomy in the College of Liberal Arts and Sciences at Iowa State University. He also is an associate scientist with the Department of Energy's Ames Laboratory. Simply stated, optical gain means more visible light comes out than goes in. This can only happen when the gain medium is externally pumped and then stimulated with light (stimulated emission). Wang's discovery could open doors for efficient amplifiers in the telecommunication industry and extremely fast opto-electronics devices. 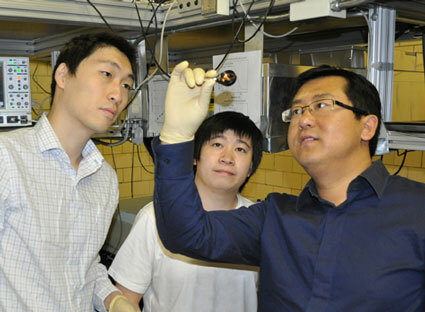 Iowa State physicist Jigang Wang, right, examines graphene monolayers grown on a substrate mounted in a cooper adapter as graduate students Tianq Li, far left, and Liang Luo look on in Wang's laboratory. Wang's team unveiled its findings in the journal Physical Review Letters on April 16 ("Femtosecond Population Inversion and Stimulated Emission of Dense Dirac Fermions in Graphene"). In addition to Wang, the paper's other authors are Tianq Li, Liang Luo and Junhua Zhang, Iowa State physics graduate students; Miron Hupalo, Ames Laboratory scientist; and Michael Tringides and Jörg Schmalian, Iowa State physics professors and Ames Laboratory scientists. Wang is a member of the Condensed Matter Physics program at Iowa State and the Ames Laboratory. He and his team conduct optical experiments using laser spectroscopy techniques, from the visible to the mid-infrared and far-infrared spectrum. They use ultrashort laser pulses down to 10 quadrillionths of a second to study the world of nanoscience and correlated electron materials. In 2004 United Kingdom researchers Andre Geim and Konstantin Novoselov discovered graphene, which led to their winning the 2010 Nobel Prize in Physics. Graphene is a two-dimensional (height and width) material with a growing list of known unique properties. It is a single layer of carbon only one atom thick. The carbon atoms are connected in a hexagonal lattice that looks like a honeycomb. Despite a lack of bulk, graphene is stronger than steel, it conducts electricity as well as copper and conducts heat even better. It is also flexible and nearly transparent. Wang said other scientists have studied graphene's optical properties, but primarily in the linear regime. His team hypothesized they could generate a new "very unconventional state" of graphene resulting in population inversion and optical gain. Wang's group started with high-quality graphene monolayers grown by Hupalo and Tringides in the Ames Laboratory. The researchers used an ultrafast laser to "excite" the material's electrons with short pulses of light just 35 femtoseconds long (35 quadrillionths of a second). Through measurements of the photo-induced electronic states, Wang's team found that optical conductivity (or absorption) of the graphene layers changed from positive to negative – resulting in the optical gain – when the pump pulse energy was increased above a threshold. The key to the experiments, of course, was creating the highly non-linear state, something "that does not normally exist in thermal equilibrium," Wang said. "You cannot simply put graphene under the light and study it. You have to really excite the electrons with the ultrafast laser pulse and have the knowledge on the threshold behaviors to arrive at such a state." Wang said a great deal more engineering and materials perfection lies ahead before graphene's full potential for lasers and optical telecommunications is ever realized. "The research clearly shows, though, that lighting up graphenes may produce brighter emissions as well as a bright future," he said.